Titanium bicycle frames share the mysterious auras that encircle all the consumer products that are made with the glamour metal. Actually,Titaniumexposed.com was created because of this. The halo really begins to interfere with the normal evolution of titanium as a structural metal, as the engineers and inventors tend to treat it as some kind of a science-fiction material, which obviously hinders their efforts to fully integrate it in new applications. "Unless someone steals it, a titanium bicycle frame could be part of the last bike a person has to buy in his lifetime. It won’t rust, and, thanks to a lack of paint, won’t ever look scratched and worn." This is a standard phrase that is commonly used by experienced bikers in order to emphasize the qualities of bicycles produced in titanium. “It is the best bike in the world. When I actually had the chance to hold the titanium bicycle frame in my hands, I discovered it was so light that it seemed more like an illusion than a real object”. Yeah, titanium is light. So is carbon-fiber. In fact, I’m certain that a carbon-fiber frame is actually lighter than a titanium one. But, for some uncertain reason, it is only the titanium frame that inspires such statements when customers first encounter it. “Quite possibly the ultimate bike frame, though usually taking a second mortgage could prove somewhat of a hassle”. I’ve never seen such an expensive titanium bicycle frame, but this metaphor properly underlines the steep price tag that is associated with titanium bikes. But THE titanium bicycle frames was no doubt the “PinBehr” nitride titanium bike frame built in the early 70’s by American engineer Cecil Behringer in association with Italian machinist Pino Morroni (hence the name). Pino machined the lugs and tubing from solid bar stock. This would still be a tremendous feat today, and it was a nigh impossible task some forty years ago. The first attempts of making a titanium bike frame, made by Teledyne Corp, proved unsuccessful and expensive, as the welds didn’t held up and the high temperatures made the metal brittle. Behringer began investigating options for joining titanium tubing in bicycles frames at lower temperatures, such as brazing. Highly reactive metals, such as titanium, are brazed in inert gas atmospheres, i.e. argon, due to their high reactivity with oxygen. After the preliminary fabrication and processing, Behringer sought the services of a vacuum industrial furnace for the final stages of the joining. Due to an unexpected error of the industrial machinery, nitrogen was substituted for argon as the coolant following the brazing, giving birth to the first nitride titanium bike frame. Set up as a track racer the new titanium bicycle was found to weight a mere ten pounds, while the road bike version didn’t weight more than twelve pounds when equipped completely. While it retained titanium lightness, it was found to be stiff enough that Morroni had the guts of throwing down a seemingly impossible bet, when he took the bike to Rome to show it off. The conservative Italian cycling industry snickered. 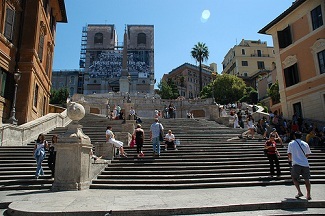 He challenged all comers to a bike ride down the famous Spanish Steps in Rome, a giant 138 steps down terrazzo. Nobody had the guts of putting their bikes to this test, so Pino went alone in what still remains one of the most famous and eccentric tests for a bicycle. Behringer evaluated the “PinBehr” bicycle at around US 10000. 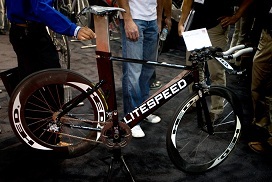 I don’t know how much this would mean today, but I figure that it would be pretty much as expensive as of the newest Litespeed prototype that has been evaluated at US 30000.